Finger stocks were used to discipline unruly children in Victorian schools. 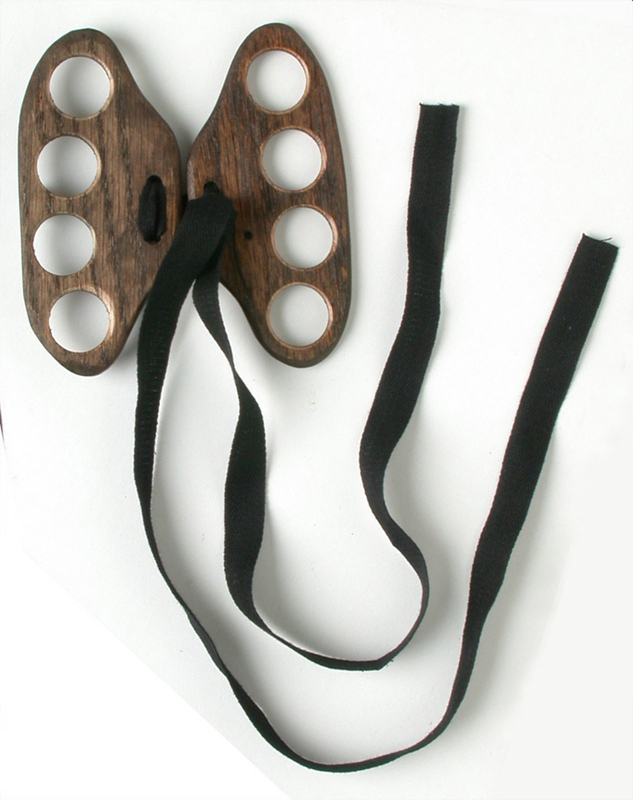 They were not used so much as a form of punishment, but more as a way of correcting fidgeting fingers. Children were supposed to sit quietly at their desks. The finger stocks would prevent nose picking or wriggling. They were placed on the fingers and then tied tightly behind the back. These wooden finger stocks are replicas that have been copied faithfully from originals. Discipline in Victorian schools was very strict. Children were expected to keep still and to speak only when they were spoken to. A common form of punishment was the cane. Children would receive strokes from a cane, the number of strokes depending on what they had done wrong, and on the mood of the teacher that day. Punishment books were kept by teachers, listing what the child had done wrong and the punishment that was given. The lists of wrongdoing included lateness, disobedience and rude behaviour. One nine year old received three strokes of the cane for scratching - finger stocks would have been less painful!